SBI PO Application Form 2019 – State Bank of India (SBI) has released the application form of SBI PO 2019 online on April 2. The last date for filling SBI PO application form is April 22. This means that the SBI PO apply online process will be available for 20 days. Candidates are advised fill the SBI PO 2019 application form before the last date to avoid any last minute hassle. While the deadline or last date for making any changes/corrections in SBI PO apply online process and fee payment is also April 22, candidates can print the application till May 7. SBI PO application form is the first stage from where the recruitment process starts for the candidates. SBI PO 2019 application process consists of registration, filling the application, uploading scanned photograph and signature, and paying the application fee. According to the exam authority, Rs. 725 is the SBI PO apply online fee for general/EWS and OBC categories, while Rs. 125 is the fee that candidates from SC/ST/PwD categories have to pay. Apart from just starting to fill SBI PO 2019 application form, candidates must completely know if they are eligible for the exam. To do that, candidates have to check SBI PO eligibility criteria. Candidates from the age of 21 to 30 can apply. Candidates with a graduation degree in any discipline are eligible. SBI PO 2019 prelims exam will be held on June 8, 9, 15 and 16. Further, the mains exam of SBI PO will be held on July 20, 2019. The total number of vacancies for SBI PO 2019 is 2000. All the candidates must keep the following documents ready before filling the SBI PO application form. Marksheets of class 10th, 12th, Graduation and other degree certificates, if any. All the eligible candidates are required to register by entering their email ID, mobile number and full name. Candidates are advised to provide valid email ID and mobile number as all the communication regarding SBI PO exam is sent to the same. After registration, a provisional registration number and password is displayed on the screen. Candidates must note down the registration number and password, as it is important. After filling all the required details, candidates have to upload their scanned photograph and signature in two separate links that is provided in the application form and as per the specifications mentioned in the notification. 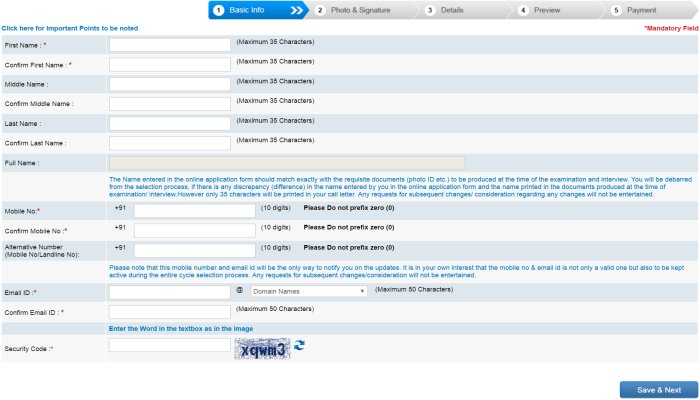 Without uploading photograph and signature, candidates can not submit the SBI PO application form 2019. 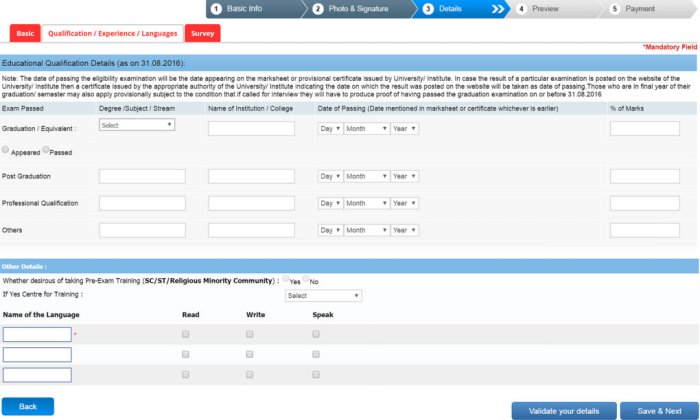 After uploading the photograph and signature, candidates must go through the application form of SBI PO 2019 to ensure that there is no mistake. Once the form has been submitted, no corrections or editing can be done. In SBI PO application form 2019, the editing option is available for three times. So, preview the form before final submission. In this step, candidates are required to pay the application fee of SBI PO in online mode only. The payment of fees can be done by using Debit Card/Credit Card or via Internet Banking. After the payment is made, an e-receipt and application form will be displayed on the screen. After final submission and payment of SBI PO application fee, candidates must take a printout and save a copy of SBI PO application form 2019 and e-receipt for future reference. If a candidate is facing any problem while filling the application form of SBI PO 2019, they can call on this number - 022-22820427 (11 AM to 6 PM only on working days). Q. Do I need to send the print out of the filled SBI PO 2019 application form? Ans: No. You do not have to send the hard copy of the filled SBI PO application form to the authorities. Q. What if the photograph or signature is not according to the given specification in the notification? Ans: You will not be able to submit or even proceed to the next step of the SBI PO application 2019 if the photograph or signature is not according to the given specification in the notification. Q. How should I change/correct the details entered in the Application form of SBI PO? Ans: Candidates can modify or edit their details before final submission of the SBI PO application form 2019. They can again open the saved data by entering their registration number and password and edit the needed details in the application form. However, this facility is available only for three times. After final submission, candidates will not be allowed to make any modification or changes in the application form. Q. Will the application form of SBI PO 2019 available only in online mode? Ans: Yes. The SBI PO application form 2019 is available only in online mode.